The Son of God chose to become “like His brothers,” sharing in our flesh and blood. He voluntarily took our abilities to feel pain and pleasure, to be tempted, to suffer, and to die. He did so that as our Firstborn Brother He might rescue us from the curse of sin. In exchange, He chose to share with us His righteousness, His spotless reputation, His renown in His Father’s eyes. He resisted the temptations common to all mankind that we might enjoy the fruits of His obedience and then, although He never sinned, died a sinner’s death on behalf of every man, woman, and child who had ever and would ever live. On this day, as we celebrate His presentation in the Temple, we also celebrate His promise to present us to His Father on the Last Day — spotless and pure within and without. Text: Since therefore the children share in flesh and blood, [Jesus] himself likewise partook of the same things, that through death he might destroy the one who has the power of death, that is, the devil, and deliver all those who through fear of death were subject to lifelong slavery. For surely it is not angels that he helps, but he helps the offspring of Abraham. Therefore he had to be made like his brothers in every respect, so that he might become a merciful and faithful high priest in the service of God, to make propitiation for the sins of the people. Audio: Click to hear the MP3 of Like His Brothers. Preached to the saints of God at Trinity Lutheran Church, Norborne, Missouri. 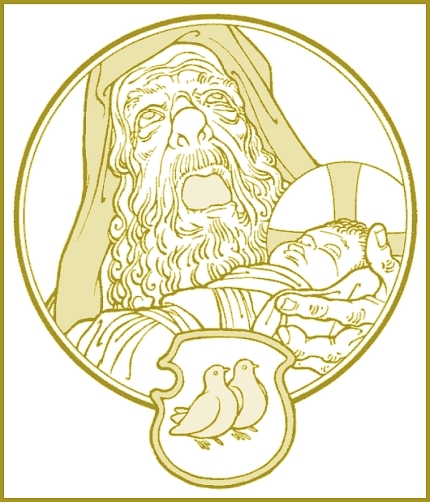 About the Art: Drawing of Simeon and Jesus from Ecclesiastical Art by Ed Riojas, available at the Higher Things Store. 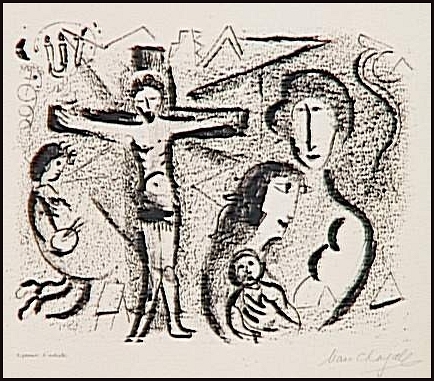 Chagall’s Christ à la famille (Christ Family) on display at Musée national Marc Chagall, taken from WikiPaintings.